Australian-first guidelines for specialist interpreters working in mental health settings, Mental Health Interpreting Guidelines for Interpreters, were launched at Eastern Health on Monday 4 December by the Victorian Minister for Multicultural Affairs Robin Scott, and LanguageLoop CEO Elizabeth Compton. The guidelines by Monash University Translation & Interpreting researchers outline the outcomes of interpreters and psychologists working together to achieve better mental health outcomes for CALD patients. The guidelines were commissioned by LanguageLoop – a Government Business Enterprise specialising in providing language services, and were part of a Monash Arts research project, A pilot study on interpreting in mental health interactions. The research project looked into the mental health needs of culturally and linguistically diverse (CALD) patients, including newly arrived immigrants and refugees settling in Australia, and found that the use of specialist interpreters can improve mental health outcomes for the most vulnerable. 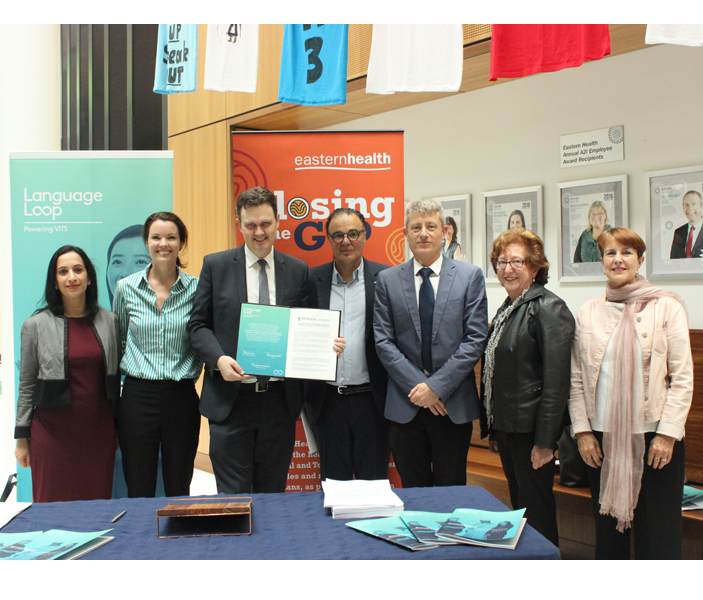 Through these Australian-first guidelines, LanguageLoop in partnership with Monash University are shedding light on the immediate need for CALD communities to access mental health services without barriers, drawing attention to the importance of interpreters’ work in this field. In the general population, more than 3 million Australians live with anxiety or depression and 45% of people will experience a mental health condition during their lives. For CALD communities and non-English speakers, this creates a greater challenge to access mental health services. Census data reveals that 26% of all Australians are now born overseas and one in five overseas born persons have arrived in the past five years. Newly arrived immigrants and refugees settling in Australia are often fleeing persecution and traumatic conditions, and it is imperative that mental health services are available and practitioners are trained and equipped to deal with these patients. Also, as the community ages, the likelihood of depression, isolation and other mental health-related issues increases, particularly in CALD individuals, and there is a real need to upskill our health care practitioners and interpreters to manage and treat these patients. Dr Jim Hlavac led the Monash University research team which examined the factors at play when an interpreter is involved in a mental health scenario, and described their role as critical in assisting professionals working effectively to help CALD patients in mental health interactions. This research has a number of recommendations to allow professionals to manage interactions that will assist interpreters and health practitioners, leading to better outcomes for this vulnerable group of patients. Through this research, Monash University has developed a specialist course for interpreters beginning early 2018, which will be delivered to LanguageLoop interpreters working across Australia in hospitals, schools, law courts and specialist mental health facilities.